In the circle of boar's blood, in the scabrous no man's land between the Moanlands of sallow grass and stunted skulltrees and the miasmic, moss-ridden undergrowth of Tatterwood, the two champions studied one another with wary deliberation, their respective tribes massed behind them, watching and waiting. One of the warriors was noticeably bigger than the other, his muscles swollen with stolen brawn. He grinned, revealing teeth fine and sharp as needles, uncannily long. His tribe were the Flesh-Eaters: through ritual anthropophagy they absorbed the strength of fallen foes. Their witch-doctors all had overlarge skulls and twisted necks made crooked by the weight of reappropriated brains taken from the heads of rival shamans, while their women were eerily sensual, become outrageously voluptuous by ghoulishly feasting on maidens taken captive in raids. The wide-hipped Flesh-Eater beauties jeered lasciviously at the men of the rival tribes, exuding a pheromone reek of fecundity gleaned from the wombs of the dead. Behind them the Flesh-Eaters' zemi stood like macabre statues, built not of carven stone or clay or mud or polished wood like the automata of other tribes but of bones lashed with sinew, notched and splintered with gnaw-marks, ideoglyphs glistening as the slave-spirits bound within their marrow purred with anticipation. The Flesh-Eater champion flexed his absurd musculature and twirled a heavy axe of etched stone. The Flesh-Eaters had no metallurgy: their tools and weapons were all of bone, wood, or stone, never copper or bronze or sky-metal. The little armour they favoured was of wood or hide, though the champion wore none, the better to display his grotesquely prodigious physique. Thick scars - some of them the trophies of battle, others intricately curving ritual marks - crisscrossed his bare arms and chest. His eyes smouldered with bloodlust and horrible hunger. The other champion, leaner and smaller of stature, had gris-gris of his own: a necklace of eyes, pulled from the sockets of sabre-toothed cats, pickled, and strung like beads on a leather cord, augmented his peripheral vision and sharpened his perceptions; a locket made from a seashell, containing a crimson pearl drawn from the depths of the Bloody Sea, lent him courage; woad slathered on his bare flesh protected it from wounds. A chitin cuirass fashioned from the shell of a molluscoid warrior he'd slain on one of the Fangs armoured his torso. He used a sword of polished obsidian he'd made himself from a shard taken from the Wyrmwaste. He would have preferred to use his gonne, a thing of bamboo and fired clay, but serpentine weapons were forbidden in such duels. A bone dagger at his waist was his only other weapon. His tribe were one of the Nameless: nomads, one of the itinerant mercenary clans who wandered from the Caul to the Worldwyrm's Tail and all the lands between, living by hunting and foraging or by bartering goods and services with those they came across. In this instance another local tribe, the so-called Children-of-the-Crow (black of eye and hair, with shamans who knew the tongues of birds), had hired them to contest a part of the Moanlands with the Flesh-Eaters of Tatterwood. The Flesh-Eater Elders (who gorged themselves on the meat of children, to rejuvenate their youth) had blustered and gnashed their jagged teeth, but when it became clear that the Children's new protectors would be ready to meet them in open battle they'd agreed to settle the dispute by single combat: if their champion was killed, they'd have no choice but to cede the disputed territories. By the sacred laws that all knew and honoured they'd be cursed if they violated the covenant: their women would grow barren, their warriors would wither, their babes would sicken and die, their water would sour and their food would putrefy. The Flesh-Eater's grisly grin suddenly vanished, replaced by a look of bestial rage, and the man-shaped horror darted forwards, axe held high. His opponent, having read the warrior's movements, tumbled aside while slicing with his blade of black glass, ripping open the Flesh-Eater's abdomen. The hulking brute's weapon hit the dry earth and produced a plume of fine, brown dust; his wound glistened, bleeding profusely. Ignoring the cut the gigantic fighter swivelled and hacked again with startling speed. This time the vagabond champion's necklace saved him, the preserved eyes seeming to swivel slightly on their thong, sending a flicker of vision to the Nameless warrior's mind. He turned the blow with his sword, showering the combat-circle with sparks. With a deft twist of the blade he circumvented the Flesh-Eater's counter-parry and hewed the cannibal's hand from his wrist. Hand and axe fell to the ground as a sanguine jet gushed from the stump. Howling in rage and pain the Flesh-Eater bounded forward, bearing the Nameless champion to the ground. His yellow teeth gleamed: he fastened his jaws round the man's neck, but the bluish paint the mercenary tribesman had daubed himself with toughened his skin, and the Flesh-Eater bit in vain. His sword-arm pinned, the Nameless warrior grabbed his bone dagger. While the Flesh-Eater scrabbled with his teeth the vagabond brought the small blade up and jabbed it decisively into his assailant's ear. The Flesh-Eater snarled, and then his eyes grew dull, the flames within them doused. The surviving champion hefted the larger warrior's huge body off his own while the shamans intoned their chants, consecrating the victory. The skeletal Flesh-Eater automata made hissing sounds as they ate the fallen warrior's ghost. Without this consumption the Flesh-Eater's spirit would haunt the battleground forever, or else dog his killer and plague his dreams. The world is a callow, raw thing, still slick with the afterbirth of creation. The primordial chaos from which it was spawned is not yet a distant memory. Monstrous beasts of primeval dimensions and colossal hunger roam the land, devouring all that they find. This is also a world of abundance and pristine, all but untouched grandeur: the mountains have not yet been hollowed of ore, the forests not yet mutilated, the seas unpoisoned by the effluent of cities. Indeed, the only true cities are those of certain elder beings that predate humanity: denizens of the deep seas and the bowels of the earth, whose surface-dwellings are but outposts of largely unseen empires. Humans, a young race even by the standards of the newborn world, share the land with many other peoples, such as the the sly, conniving Ophidians (who are said to slither freely between this world and the world of dreams), the calculating, inscrutable Trog, and various enigmatic insect-peoples, to name a few. Still, however, the world is mostly a wild and empty place, the land untamed and unexplored. Countless new discoveries await any who dares to stray beyond the bounds of inchoate civilization. Everything has a spirit: a tree, a river, a mountain, a field of grass. A thousand little gods fill the world; placate them or suffer the consequences. Animals speak their own languages which other beings can learn, with effort. The souls of the dead can linger, if they died violently; even those that pass on can be dredged from the limbo-muck where they await reincarnation. Spirits can be harnessed and trapped as well as communed with: bound within fetishes and totems, or even into living flesh. Humanity's gift is that of inventiveness. Though steel has never been forged and crafting using iron or base metals is still a poorly understood art, the steppes and forests echo with the rattle of firearms, bamboo hand-cannons and ceramic firespitters and copper cannons that hurl stone balls. Daring pilots take to the skies in balloons of tanned hide, rickety gyropters, and intricate hang-gliders. Mechanical automata animated by medicine men labour to stack mud bricks for houses or dig canals for nascent irrigation systems. Some shamans use drugs and strange witcheries to augment their minds so powerfully as to allow for near-precognition; others commune with megaliths bound with thousands of souls, stone repositories of countless memories that function like databases for those who know the appropriate pass-rites. So-called dreamwalkers nightly enter the nebulous realm of Dreamspace, refashioning their mental avatars into myriad shapes, communicating with one another over vast distances. There are no castles to retreat to; there are no battlements to cower behind. Monstrosities, vengeful gods, malignant demons, savage enemy tribesmen, and a million hungry beasts fill the world with perils. Few tribes have developed proper agriculture: hunting and gathering is still the norm, leading to a feast-and-famine existence. Storms, drought, and cold weather can decimate entire communities. Pestilence, sometimes spread by the horrific servants of Nirgali, claims many daily, despite the efforts of healers. This world is red in tooth and claw: compassion is a luxury, and frequently one must kill or be killed. Play as a witch-doctor laden heavily with gris-gris and speak to the spirits of the ancestors; as a hunter who can switch skins with the strange beasts he pursues; as a brave who wields a pair of sophisticated ceramic pistols; as a 'walker who taps into the forbidden archives of innermost Dreamspace; as a demon imprisoned in a body of etched stone; as a ghost on a quest for vengeance; as a humanoid serpent. Evade capture by the slavers of the Ophidian Empire and steal gemstones and hexed weapons from mysterious cromlechs. Barter with the misshapen folk of the Carrion Kingdom that lies in the bowels of the earth, trading hides or knowledge for their wondrous, sinister machines. Fight rival tribesmen in treetop villages with hurled curses, bone crossbows, or bamboo hand-cannons. Take to the skies on the back of trained wyrms or giant dragonflies or strapped into some intricate, unlikely vehicle; explore the Sky Mountains that float amongst the clouds. Wander the coral fortresses and shadowy grottoes of slithering deep-dwellers in a bitumen-smeared wooden submersible beneath the Gurgling Sea. Outwit one of the mischievous Tricksters or seek out Grandmother Spider to receive her cryptic wisdom. Most of the world is unexplored: there are still whole continents uninhabited by humans. The central inhabited continent is Mu, which extends from the Caul - a mountain range in the polar north - to the Worldwyrm's Tail, a cape in the extreme south. Major landmarks include the Tree of the Heavens, a vast cedar tree at the center of the Omphalos Forest, said to be the 'Navel of the World': here a human proto-city thrives, dwellings and workshops and temples suspended in its branches and linked by swaying bridges, or else carved into its gigantic trunk. Also of note is the Wyrmwaste, a huge plain of ash and obsidian riddled with active volcanoes, many of which are Wyrm-lairs. Two smaller island-continents flank the central landmass of Mu: to the northwest is Thule, cold and grim, whose pale, vicious folk are marauders and skilled sailors, while to the southeast is Lemuria, a lush, tropical land under the rule of the Ophidian Empire. Gunpowder, in the form of serpentine powder, is fairly well understood: it was developed after a shaman mixed together crystalline bat guano deposits (nitrate of potash), brimstone, and charcoal. Consequently, those tribes with territories near to sulphur deposits tend to employ firearms the most, and sell gunpowder to other tribes. Matchlock mechanisms are the most common, but crude wheellocks and even flintlocks with frizzens of fire-hardened sky-metal are also occasionally seen. Grenades and rockets are also widespread; incendiary weapons - firespitters and the like - are likewise not unusual. Electricity is not yet fully understood as a physical force, but batteries made from terracotta, vinegar, copper, and sky-metal are used by some tribes, allowing for the construction of arc-lamps, electrified fencing, and even electroshock weapons. Analog calculators - known as Sortilege Mechanisms - are far rarer, but do exist, mostly being used to assist in mathematical and astronomical calculations; generally, such machines are built of bronze, but some have stone components. While automata exist in great numbers, their sentience and animation is derived from slave-spirits bound within them rather than from pure mechanics. Manned flight has been achieved in a variety of fashions. Most common are hot air balloons of tanned hide and crude hang gliders made of leather, wood, bone, and bronze. More elaborate flyers are somewhat rarer but still far from uncommon: gyropters and ornithopters, rickety things powered by battery, gunpowder charges, compressed air, or simple manpower. Ground vehicles are rarer: horses and other domestic riding animals are widely available, and wagons and rickshaws are used to transport goods and people. Solar power is widely utilized in sunny regions, especially in the form of solar ovens. Some settlements sport enormous defensive burning mirrors which, when properly tilted, concentrate the sun's rays to devastating effect. Burning lenses are also used to cauterize wounds and to power large furnaces for the smelting of metals. What the hell is this? I don't know yet, really, but for a long time I'd been toying with the idea of dong a sort of 'spiritual prequel' to the Cadaverous Earth set at the very beginning of a world rather than at the end. There are several primordial/Hyborian/Bronze Age settings already out there on the site, though (the Bronze Age, Arga, Primeval), but I was recently replaying Zeno Clash and started wondering about the possibilities of true Neolithic Fantasy and "Stonepunk"... let me know what you think! EDIT: Is the title good? Any other ideas? >>There are no castles to retreat to; there are no walls to cower behind. Monstrosities, vengeful gods, malignant demons, savage enemy tribesmen, and a million hungry beasts fill the world with perils. If they don't have anywhere to develop safely, how do they have enough time to build their tanned hide balloons? I suppose that the technology is just created quickly and transiently, but it would appear to require some time to settle down in order for inventors to have a chance to invent. Similarly, a division of labor seems to be needed a bit, which implies either extremely efficient hunter-gatherers, or an agricultural society. You later mention that there are clay houses... why aren't these houses surrounded by city walls? It's a similar concept- even Mesa Verde had walls and protection. Good point about the total lack of walls... they probably would have walls of brick or wood. I tweaked the description. Labour-wise, they have the automata to do most of the really hard physical work, which frees up a lot of time for invention. Likewise automata (zemi) could supplement a tribe's warriors to help protect a settlement. There is a bit of agriculture here and there, but like metallurgy it's still emergent and fairly uncommon. I do see the world as having some hotly contested areas of near-Edenic plenty as well as barren deserts and the like, so those tribes who manage to take and hold the most resource-rich areas would probably have the best inventions as a result, since less time needs to be devoted to feeding themselves. Also, you're spot on that the tech should have a hasty and cobbled-together feel, with a very DIY punk sensibility. Impressive as usual. Very evocative language, and prominent and visceral themes. Both help me get a really great feel for the setting without you actually presenting too much information. You say gods are young and innumerable. How about for the older civilizations, 'the deep ones'? Are their gods more established, do they even have any, are they themselves transcendent in a way? Just some things I'm curious about! Stuff to ponder. I'm thinking the gods of various elder civilizations will be more of the Lovecraftian and aloof variety than the petty gods of rock and tree that crowd the earth. 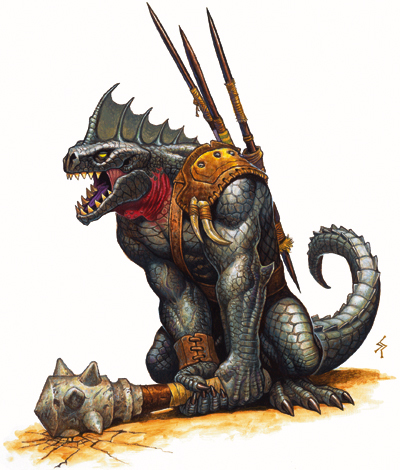 The Saurians (think evolved velociraptors crossed with the lizardfolk of Warhammer) worship their kings as gods. And are your gods similar to those in Turtledove's Between the Rivers... http://www.amazon.com/Between-Rivers-Harry-Turtledove/dp/0812545206 They sound similar; and I think that is an excellent way to execute them. I think I like this best out of all your non-CE settings to date. Yeah, the paradisaical locations would be sort of Great Valleyish. Maybe I should make them genuinely preternatural in some way? Perhaps a resident spirit of some kind infuses the land with vitality? With regards to the gods, I was thinking sort of like a chop suey of shinto, Native American, Celtic, Greek, and Sumerian mythology. An array of animistic minor 'deities' or demigods would fill the world, with more powerful gods ruling over portfolios. The gods are definitely real in some form or another, even if the beliefs around them aren't always 100% correct. Glad you like it, Kindling! Question: should there be dinosaurs at all? I was thinking more prehistoric megafauna and the like, plus a lot of primordial fantasy beasts. Obviously the setting isn't realistic, but I feel like dinosaurs might be a bit too campy to include. Despite some superficial similarities and a hint of tongue-in-cheek humor I want to avoid a Flintstones kitschy feel. I'm all for having big, primordial beasts rampaging around, but if they were referred to as dinosaurs I'd be a little turned off. I think even if I saw a big, stunted arm, bipedal, sharp-toothed green lizard that's called a "Bonecrusher" or something, I'd still be a little wishy washy about it. I think the concept of having big, prehistoric animals is good, but I think it deserves to be executed in a more "CE" (or, in this case, "Mytholith") style. Damn, that definitely brings me back to Primeval. Except, the writing is far better. I shall be following this for sure. Too bad I'm too busy to work on my own. Edit: I carefully reread everything and it's much better than I had first thought! OK, cool. The closest thing to dinosaurs then will be the lizardfolk-type people, who wouldn't be out of place in a fantasy setting anyway. They will be kinda like this, or this. Are there any large flying beasts then? I think pterodactyls (given an appropriately flavored name) would be a nice touch for this kind of world, even if there are no dinosaurs. Cooler than plain giant birds, anyway. I think maybe there might be dragony things somewhere between pterodactyls and wyverns. Sketch... going for a slightly smudged "cave painting" look (but obviously more detailed). Very gently NSFW.